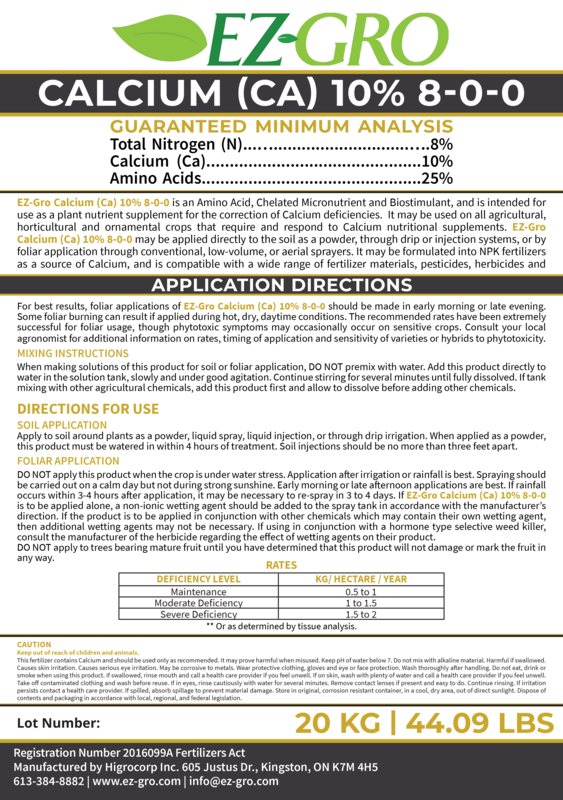 EZ-Gro Calcium (Ca) 10% 8-0-0 is a versatile plant nutrient supplement powder, which exploits amino acid chelation to enhance its bioavailability. As an essential second messenger, calcium is associated with virtually all aspects of plant growth and development and acts as a signal to elongate both shoots and roots. It is also crucial for the proper incorporation of cell wall components, and therefore has a structural role in the quality of plant development. Add EZ-Gro Calcium (Ca) 10% 8-0-0 to your current fertilizer regimen to remedy calcium deficiencies and improve growth, yield and quality of your plants.